Nagaarum is quite an active solo-project by Gábor Tóth, whom you might know from bands such as In Vacuo, GuilThee or Sunseth Sphere. 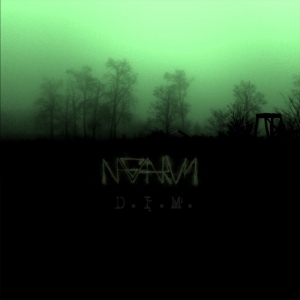 This project started in 2008 as an Industrial / Ambient outfit, but Nagaarum permanently evolved. In the near future I will write and publish a review on Homo Maleficus, the 2017-album, but first I’ll write some words about 2016’s D.I.M. D.I.M. was written, recorded, produced, mixed and mastered completely by sole member Gábor himself, and he took care of the artwork too. The album gets released on CD with an eight-page booklet via a Russian collaboration (Outer Line, GS Productions and Endless Winter), limited to 300 copies. The album, which clocks forty minutes, starts off in a mostly devastating way: massive guitar riffs, intolerant drum salvos and devastating bass lines. Wow, what a skull-crushing start! And that heaviness is like a basic structure for the whole album, but I assure you: there is much more to experience. A first remarkable element, for instance, is the vocal appearance. I just mentioned the opening sequence of this album. Well, quite soon the vocals join the colossal outburst, and they are sort of dual: hoarse, shrieking screams at the one hand, and melodious clean voices at the other – both appearing in a symbiotic way. There is a lot of variation too, going for song structure, speed, atmosphere and the style being used – not the sound (see further). All those elements are related, of course, yet still it remarkable how easy it seems to add such differentiation, not only ‘in between’ the separated tracks, yet also ‘within’ each single composition. Fast eruptions interfere with psychedelic slow parts, being hypnotic, then again psychedelic or even psychotropic; melodious leads easily interchange with heavy riffs and even some chaotic excerpts; integer excerpts penetrate some violent and / or sinister chapters; psycho-cosmic aspects are naturally injected within pieces of Ambient-laden spheres; blackened eruptions easily follow or precede floating ambient soundwaves; and so on. It’s like a mélange of Post-Black, Doom Metal, Ambient, Progressive Rock, Dark Metal, Avant-Garde Folk, Psychedelica and so much more, mingling timeless elements with modernistic touches. For sure this stuff is experimental and quite heavy to digest. The sound quality is pretty powerful, with a well-balanced mixture in between the different instruments. At the same time it is enormously overpowering, and still every single player (read: instrument) has its role into the whole play. It makes the result, which surely is not that evident to get through, even more overwhelming, yet more acceptable too, I guess, for all ‘inferior’ details are not minimised towards ‘just supporting the lead parts’. It is clean, yet not of the clinically polished kind, and therefore a surplus on D.I.M. This album, and this goes for most of the Nagaarum recordings, I guess, needs endurance and persuasion. But after some listens, the whole sonic picture shows its core, and then again not either – I mean that things get clearer each time you go through this record, but each time new elements will appear, confusing you, teasing you to continue. And hey, isn’t that a great experiment / experience? Indeed it is.